Affinity purified against recombinant protein GST- OTULIN [DU 43487]. 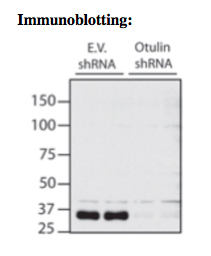 HEK293 IL-1R cells expressing shRNA for OTUBLIN or an empty vector were lysed and 20 μg of cell extract protein was run on an 8 % gel. Proteins were transferred to a PVDF membrane and immunoblotted using 0.5 μg/ml of S529D. The indicated amounts of anti-Otulin antibodies or pre-immune control IgG were incubated for 16 h at 4oC on a rotating wheel with 0.025 ml of cell extract (0.5 mg protein) from unstimulated IL-1R HEK293 cells and 7.5 μl of packed Protein G Sepharose beads. After centrifugation to pellet the antibody-Sepharose conjugate, the supernatants were removed and the immunoprecipitates washed three times with 50 mM Tris-HCl pH 7.5, 1 % (v/v) Triton-X100, 0.05 % (v/v) 2-mercaptoethanol and 0.2 M NaCl. 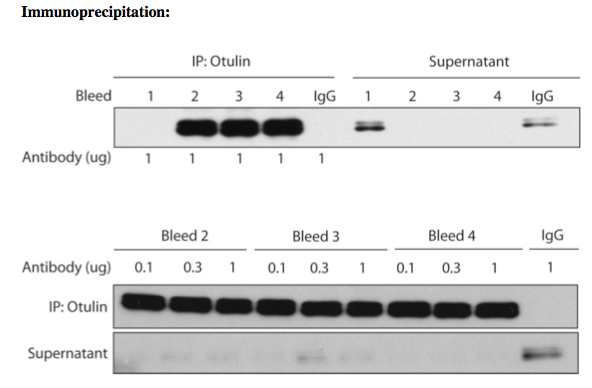 The supernatants and pellets were denatured in SDS and aliquots subjected to SDS-PAGE and immunoblotting using a commercial Otulin antibody from Sigma (HP A051074).